Wedding Tips - Home or Salon for your hair? This one is going to cover two main discussions; whether to get the professionals to take care of your hair on the day; and whether or not to get your hair done at the hairdressers or at your getting ready location. I am a big believer in utilising professionals; they know what they are doing, they can fix things that go wrong, and they are trained in all hair types, face shapes, etc. They will know what suits you, your face shape, and your hair type. You will feel pampered and like a princess; everything you deserve to feel on your wedding day. Hiring a professional takes the stress out, and you can rest assured that they know how to deal with a variety of scenarios. Not to mention, they can ensure longevity in your hairstyle, to make sure it lasts well into the night. I also recommend, when possible, to hire a hairdresser that will come to your getting ready location and style your hair. Firstly, it means you are not going backwards and forwards around town on the morning of your wedding. You get a more relaxed, chilled out atmosphere, and you aren’t worried about rushing to appointments first thing. Secondly, the light in hairdressers is rarely the most flattering. 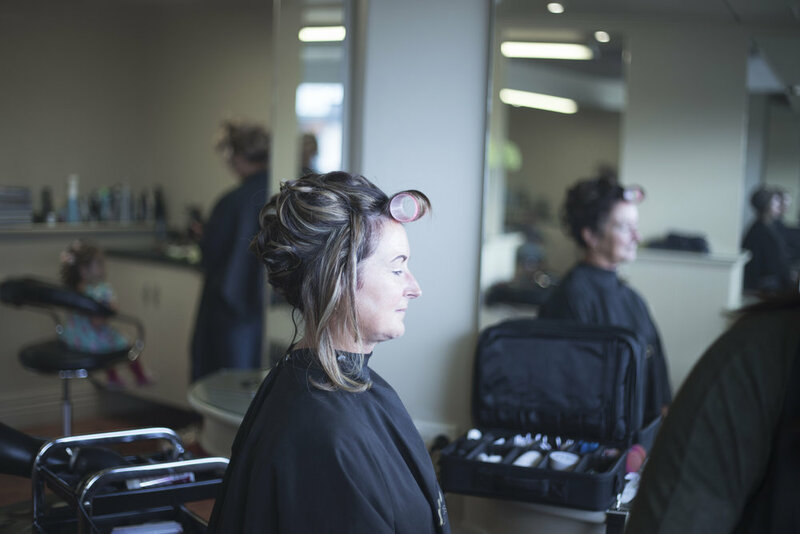 The lights in the salon are suited to the stylists doing their work; whilst wedding images look universly flattering when we utilise natural window light. However in saying that, I am always happy to work with whatever is going to suit you best. Thirdly, if your hair and makeup appointments are at home, that cuts down on travel time and gives us more time to get beautiful images. Whilst the make-up artist and stylists are working their magic, I will photograph all your beautiful details. I then move on to photographing the finishing touches of the make-up and hair. Newer PostIncluding pets on your wedding day. Older PostYour free wedding checklist.